This week’s theme is: Freestyle! .-= Thom´s last blog ..Silly Haiku Wednesday – Free Style =-. Great Haiku, I like the occasional freestyle week to see what everyone else goes with. I saw something on the TV recently which reminded me of a trip to Florence years ago so decided to combine both posts. 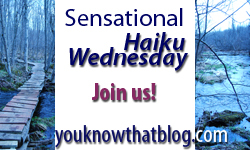 Thanks for hosting the Haiku Wednesdays I really look forward to them! Hope you had a great holiday and caught up with lots of sunshine, looking forward to hearing all about it soon. .-= Jade @ No Longer 25´s last blog ..Fabulous Firenze =-. Yes! Though of divergent faiths, friends we remain! Very nice! .-= Polly´s last blog ..Haiku Wednesday: November 11, 2009 =-. That is great!! I love the new header too! .-= Lee the Hot Flash Queen´s last blog ..PS Just Kidding =-. Thanks for hosting….this is a lot of fun! .-= Janet´s last blog ..Silly Haiku Wednesdays – Freestyle! =-. I might be able to upload a haiku later today. I just put up a new blog post after a long hiatus! .-= Meg´s last blog ..So, What Are You Thankful for? =-. I have missed you bunches! Are you back from va-cay, yet? Hope you have lots of pictures to share!! Love this Haiku and I could not agree with it more!!! .-= Jessica´s last blog ..Silly Haiku Wednesday =-. Friends are such a powerful force for good. Like’em, Love’em, can’t get enough of’em! I can’t seem to ever get to your current day! Could ya help a girl out? What am I doing wrong? .-= Michelle aka Catholic Lady´s last blog ..Haiku Wednesday: Parent(s/ing) =-.